Plan for re-entry. Rain showers day. Cabin fever. Planning up to airport and beyond. Brad completes online job application, hunched over small iPad screen, forefinger punching furiously. Uses cafe’s free wifi. Growls for chat avoidance. Back at the campsite, Sam, using his bicycle speedometer, measures Joe’s running speed. Joe sprints downhill. Tailwind. On tarmac. No bones broken. No skin loss. Sam reckons Joe is faster than Usain Bolt. Last full day cycling through rural Fishing Japan. Coastal riding finishing with an awesome camp spot on a cape. Mummy Macaskill setting a solid tempo on the front of our wee peleton. Arrive destination, after 6 hrs saddle time. Push loaded bikes up stairs to access campground. One of the best spots of our journey. Surrounded by black volcanic rocks (Sam & Joe climb), and views over Sea of Japan & coast we’ve just ridden. Mummy Macaskill heads into town to buy sprays that KILL insects (rain & sun producing some nasty biting mini beasties). Sam & Joe find beach and design more racetracks with tunnels. Heidi returns from town exasperated, “they keep wanting to give me insect REPELLENT, when I want insect KILLER. Aaaaaaggggghhh!”. Heidi shows how she used the finger-across-throat gesture to signify KILL. Quite scary. Brad is glad he wasn’t the shop assistant. Last days cycle touring. Last non-sightings of mysterious Bears. Last BBBBRRRR tunnel. Last UP UP UP. Last DOWN. Sad. Finish the day on busy main road. Trucks, buses, cars. Entering the city of 函館 (Hakodate). From here, it’s all trains and town riding. Back in URBAN JAPAN. Busy. People. Find an ONSEN hot spring in hotel. Approach spa entry desk. 2 ladies at desk. Heidi asks lady A, in Japanese that’s worked a thousand times before, “2 adults and 2 children for the ONSEN, please“. Lady A points to hotel front desk. Heidi & Brad, tired & grubby after 100km cycling on busy truck roads, cross lobby barefooted (can’t be arsed with shoe protocol). Join queue of well dressed patrons. Reconsider. Barefoot return to Spa desk. Repeat in Japanese to lady B this time, “2 adults and 2 children for the ONSEN, please”. Smile. Lady B completes transaction. Lady A shuffling papers on desk. Head down. A man behind us, listening in, interrupts (a first in Japan) to correct Heidi’s pronounciation. Heidi looks at man. Brad gets scared. Man backs off. Heidi smiles and thanks him. Brad tries smooth things, smiles, over exaggerated gestures, “we tired. Cycle. Tired. Cycle. Thank you. Thank you”. Well used openers. NOTHING. “We cycle half year Japan. From Ishigaki. 6000 km”. NOTHING. Back in Urban Japan. Tent was pitched on the rim of an overgrown, crappy baseball field. 5am a baseball game is underway. Must move tent. Nobody ever actually hits the ball in baseball so needn’t have bothered. An early start with nowhere to go. Spend sunny day seeing the sites of Hakodate (one of first ports to open its doors to international trade following Japan’s 200 odd year policy of isolation). The foreigners cemetery is locked? Concern about being defaced?. Devalued pound sterling (and ONSEN etiquette fatigue) means swapping ONSEN for basin in public loos. Day ends with being treated to a meal in traditional Japanese bar/restaurant (beer, sake, delicious grilled fish, fresh octopus). Tent pitched on a moat island in, arguably, Hokadate’s most famous park. With permission! Homemade Cornish pasties (with proper meat) for breakfast. Ian, Emi, Noda, and MAMMA SAN. Thank you so much. Your timing couldn’t have been better. How to transport 4 bicycles and 76 pannier bags by train in Japan. Find train station. Unload bikes of panniers. Take bikes apart. Photo pose with friendly tourists. Start to wrap bikes in tarpaulin (too small for job). Photo pose with tourists (smile). Pray everyone in train station happy with botched wrapping job. Carry wrapped bikes & panniers train on platform 7. Maximum supplication (ie, max head nods) towards train staff. Cringe at self, but no shame in begging when you really need to. Load bikes & panniers onto train. Try enjoy three hour train journey, jumping up at each station to move bikes to make space for alighting passengers. Many stations, many silent tut tuts. Heidi comes down with train sickness. Arrive in Sapporo (population 2million). Japan’s 5th largest city. Repeat as above. But in reverse. But less cringeworthy supplication towards train staff as nothing they can do now! Put bikes back together. Phot pose for tourists (smile). Baking hot in the sun. Head towards river searching for stealth camp spot nowhere near any baseball pitches. 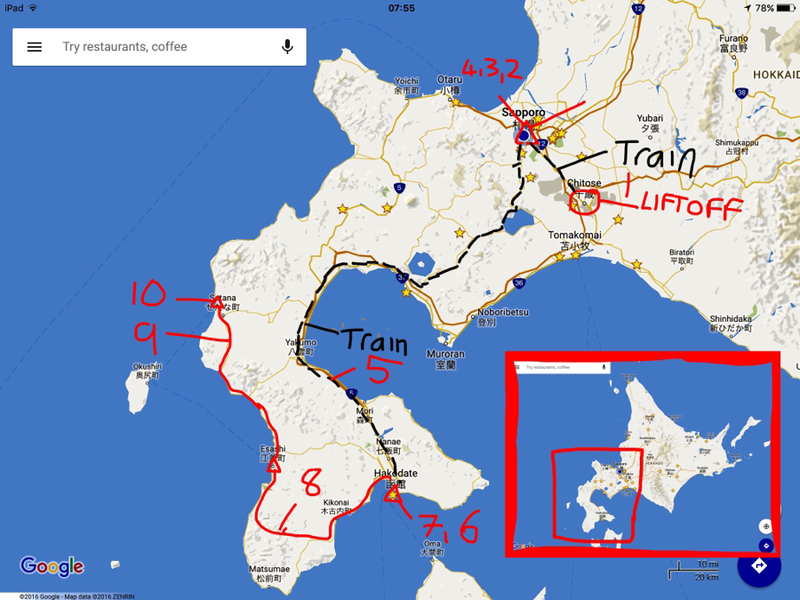 Crossing the t’s & dotting the i’s of our Hokkaido adventure. Museum & Folk Museum of Hokkaido. Outstanding. Making sense of what we’ve seen. Of where we’ve been. Reconstructions of the abandoned & decaying wooden buildings we’ve spent hours cycling past. Traditional farmhouses that we’ve lived in. Names & places we’ve cycled through. A highlight of our trip. Rainy day spent around Sapporo city centre. St Petersburg in Russia gets an average of nearly 3m of snow each year. Sapporo gets double that. A city of 2 million handling 6metres of snow each winter. How do they do it? Have a city beneath the city. Undercover arcades. Indoor baseball stadiums. Compared to where we’ve ended up on rainy days, Sapporo is a dream. We spend hours in a bookshop. We wander shopping malls. Wide eyed wandering amongst Hi-tech Japan. Consumerist Japan. Urban Japan – The Japan we know least about. When darkness falls we eat noodles in a local restaurant and then, for the last time, search out a stealth camp spot. The rain eases, making life easier than expected. 3am Joe wakes up complaining of a sore stomach. Gags. Before I can open the tent. Vomits. Last night’s Noodles were a mistake. We don’t mind because we won’t be needing the sleeping mats again (for this trip at least). And, tonight, we’ll be in a hotel with washing machine. And a shower. Electricity! Television. 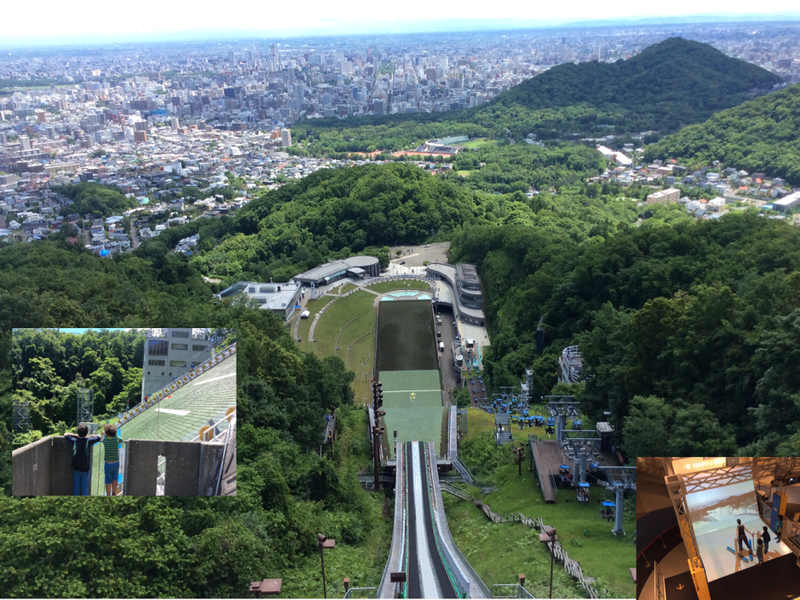 Today we cycle to the 1972 Winter Olympics Ski-jump venue and watch Japan’s junior squad fly. One of the most exciting things we have ever seen. We too, will soon be flying. Our time is very nearly up. I am typing this at 6.30am Monday morning (Sunday night 10.30 UK, 11.30 South Africa). It was great staying in a hotel last night. We found a great curry soup restaurant and voted for top campsite spot, too ONSEN, top, bottom etc…etc…the sheer number of experiences we’ve shared is staggering. We’ve been in some pretty remote places here in Hokkaido. This morning we will pack our bags ready for the flight home. We’ll probably leave some clothes, shoes, kit behind because they are in such a state after 6months hard use. How it should be. Then to load the bikes into cardboard bike boxes (yesterday’s job), and catch a 30min train to the airport. The airport has an ONSEN hot spring and space for sleeping overnight. As we prepare to fly home to Scotland after six months and 6 thousand km cycled on Japan’s roads with our boys, now 8 and 9, all more than a bit sad to leave. Japan has been an incredible country to tour with kids. We spent the final two months in Hokkaido, our favourite bit on the bikes for its wildness and space, mainly touring whole coast, with incredible wildlife, but also plenty hills and lochs And some wee islands to explore in the rain! No bears tho, thank goodness. Would like to recommend two organisations lest not known. We spent half our time cycling, and half volunteering on farms through WWOOF, from rice farm in iriomote to dairy farm in Hokkaido, with veg, forests, bakery, permaculture and more in the middle. Great for living, working, playing and eating with Japanese organic farmers and families, and for travelling on a budget. We will fly out of Chitose Airport, Hokkaido Tuesday morning 9am (01.00 am UK, 02.00, Mom in South Africa).Then to Tokyo (the closest we will get to visiting the main place associated with Japan), then Frankfurt, then Aberdeen at midnight. (01.00 Wednesday morning, Mom in South Africa). 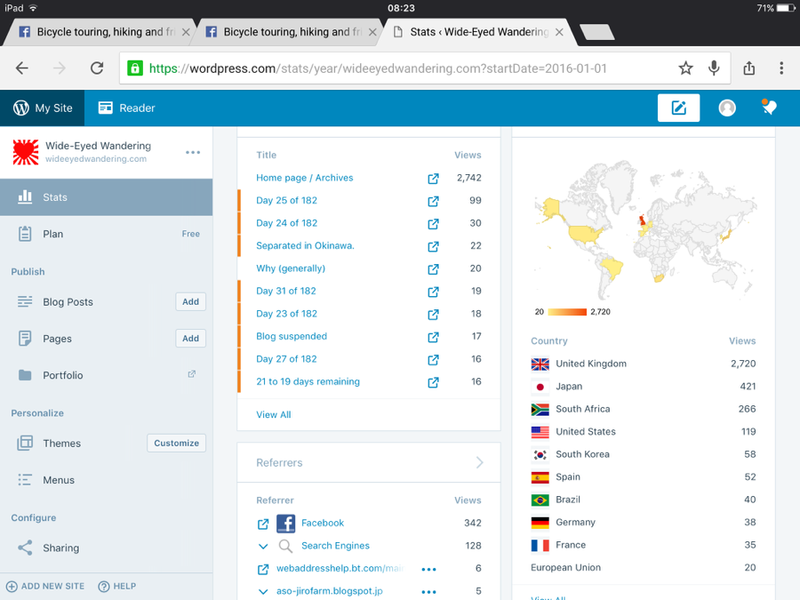 From what I can tell from the blog stats page, there have been a scattering of you regular readers of the blog the whole time. About 10 hits a day. (Numbers would shoot up dramatically whenever Heidi posted on Facebook. The fake photo of me being arrested in Korea attracted the most hits in a day by a long way). My aim was never to get big hits, but to use the Internet as a way of sharing with friends & family: the original idea behind Social Media. An unintended, but significant benefit of daily updates was also a chance to reflect on the journey as it happened. It wasn’t always easy to find time or energy to write. Thank you to Heidi & the boys for making this possible. I hope you enjoyed reading about our 6 months here in Japan as much as I enjoyed writing about it. And as Elmer Fudd so elegantly puts it, “ddddd that’s all folks”. Well done guys and congratulations on completing an incredible adventure. Been a big inspiration to us along the way. Enjoy home, good luck for the job Brad. I was in the EUMC with Heidi and noticed your blog pop up a couple of times on my facebook feed via Chad Harrison (also EUMC) and my cousins the Gambles in Torphins (small world). So I had a quick impressed look. Then next time it popped up, another, and I’ve been following you ever since. Fascinating reading and seriously impressive especially by the boys. Anyway, reading today that there seemed to only be a small group of regular readers (I’ve read every word since about the start of March), I felt like I ought to own up. So hello again to Heidi if you remember me and hello to the rest of you. May coming home be a pleasure as well as a culture shock! I can’t tell u how much I’ve loved reading your blog, and I’ve read every word from the airport at the beginning! Feel like I’ve learned a tiny bit bout Japan. Thanks so much for sharing…social media amazing boon when with right spirit. inspiring adventures! Sharing humanity! trying together to understand! Hope you settle back to normal happily and find a place in your family to continue to share this adventure. Much love! thanks for the message – we are settling back in fine. All feels surreal now that we back home. Joe asked us yesterday if we actually went to Japan.